Many visitors think Cappadocia is a city and are surprised to find out that it is actually a large region touching 5 Turkish provinces. In fact the central area of Cappadocia is made up of small towns spread out around the various hills and valleys that make the region so beautiful. In this post we want to give an introduction to 10 towns which will hopefully allow you to better plan your time. 1. Uçhisar – Sitting near the highest point of central Cappadocia, this ancient fortress town is impossible to miss and offers amazing views. Named after its landmark rock tower/castle, the town offers excellent shopping opportunities as well as a number of delicious restaurants of which we recommend the House of Memories, Seki, Şira and Elai. If the weather is nice, you will definitely want to pay the 8TL to climb to the top of the hisar and get a unique view of the area. This is also the best place to enter the inviting Pigeon Valley and hike all the way to Göreme if you wish. 2. Ortahisar – “Orta” means middle indicating that this is the middle hisar (if you can find the third hisar, let us know), or at least it was known as such when the defense of the region through the hisar system was important. Unfortunately, this hisar needs to be renovated and is not open for tourist ascension. In spite of that, you will enjoy this quaint village with its valley views, shops, and constant supply of old men hanging out in the city center. This town is also known locally for the best barbers in the region. For those of you looking to get an old-fashioned shave, take advantage when you visit. If you are there around lunch time, go a bit off the town square to Seten Pide and order a couple of delicious pides (similar to pizza but Turkish style). 3. İbrahimpaşa – But on the road between Uçhisar and Ortahisar we skipped 19th century Ibrahimpaşa. 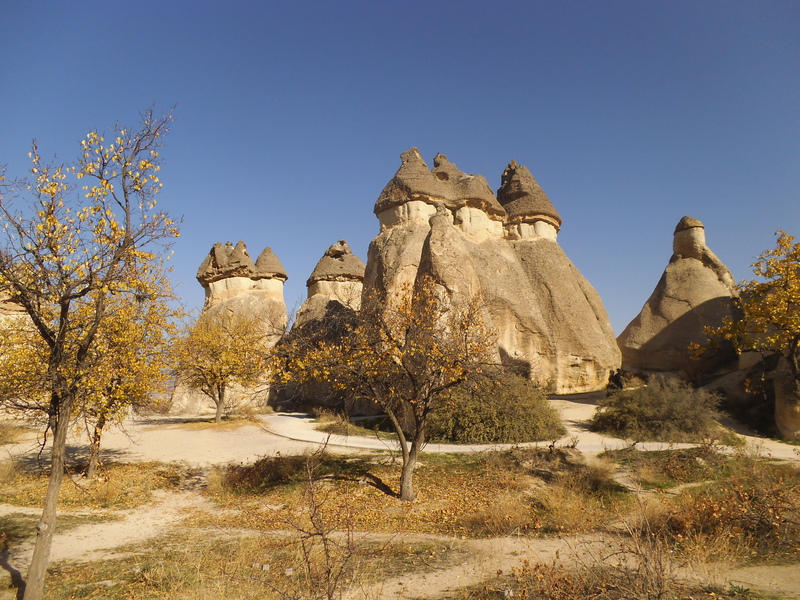 2 kilometers off the main Nevşehir – Ürgüp road you will find this village that seems stuck in the past. If you feel like the rest of Cappadocia is too touristy, Ibrahimpaşa is the place to spend a few hours. Even though it is barely more than a stone’s throw from the main tourist attractions, this valley straddling village is relatively untouched (and unvisited) by the many foreigners who traipse through the region. If you can get someone to drop you off, you can enjoy a wonderful hike down the valley to Ortahisar. Transportation is difficult to arrange, but worth it for this half day of fun. And if you are looking for a special dinner, we recommend the Babayan Village House. The set menu is homegrown, homemade, and delicious at a reasonable price. Be sure to have your boutique hotel make reservations and help you with transportation. 4. Ürgüp – Keep going down the road and you will end up in the most developed town of the area. Ürgüp’s broad town square is surrounded by unique shops, restaurants, and wine-tasting houses. You can stroll around and sample the delicious dried fruits and nuts, check out the Ebru Art, price beautiful Turkish carpets and rugs, and enjoy tasting the many different local wines. If you stop by on a Saturday, be sure to stroll through the expansive open air market (Turkish: Pazar). For restaurants we recommend Ziggy’s which is about halfway up the hill towards the Turasan winery. 5. Mustafapaşa – About 15 minutes from Ürgüp you will find this Greek village formerly known as Sinasos. In 1923-24 the powers that be ordered a population exchange forcing all the Greeks (actually it was Christians but most non-Armenian Christians were Greeks even though they spoke only Turkish) in Turkey to move to Greece and replacing them with Greek-speaking Turks (Muslims) from Greece. In Mustafapaşa the Greek buildings were preserved and can be viewed today. You also can enjoy a nice dinner at the Old Greek House. 6. Avanos – Over the hill, on the Kızılırmak (Red River) you will find a quaint town known for the pottery made from the red clay along its river banks. With a population of around 14,000, Avanos is full of shops and restaurants as well as a nice riverwalk area with lots of grass and trees. 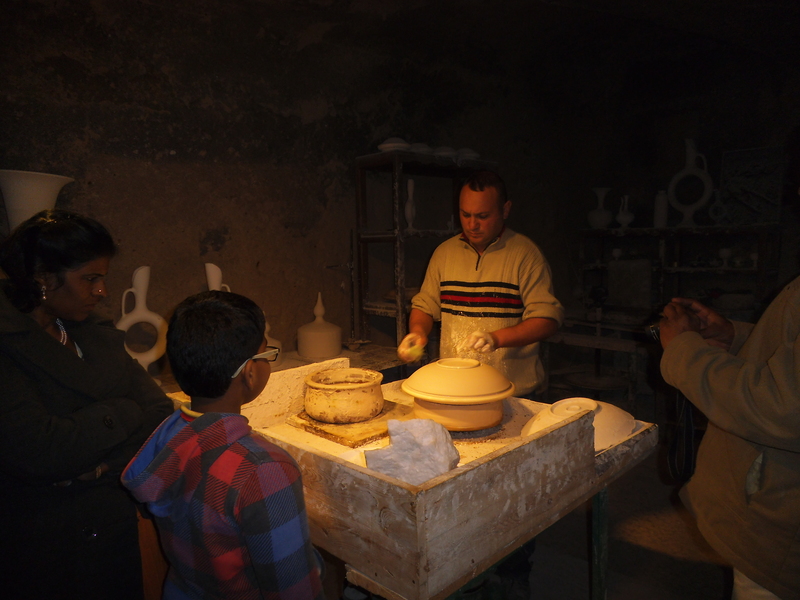 The main draw, however, is the plethora of pottery shops, each with its own master working the wheel. Be sure to observe a free demonstration and even try your hand at “throwing” a pot. If you want to catch a meal we recommend Mado along the river, Lale Pide & Kebab in the center of town, or Bizim Ev closer to the bridge. And if you are there on a Friday, take a stroll through the open air market. 7. Çavuşin – Halfway between Avanos and Göreme this village sits with its magnificent upper church ampitheater that dates to the 4th century. This also marks the opening to the trails for Rose and Red Valley and is just around the corner from Paşabağ, which boasts some of the best Fairy Chimneys in the region. 8. Göreme – A few clicks further finds you in one of the most unique villages in the world. 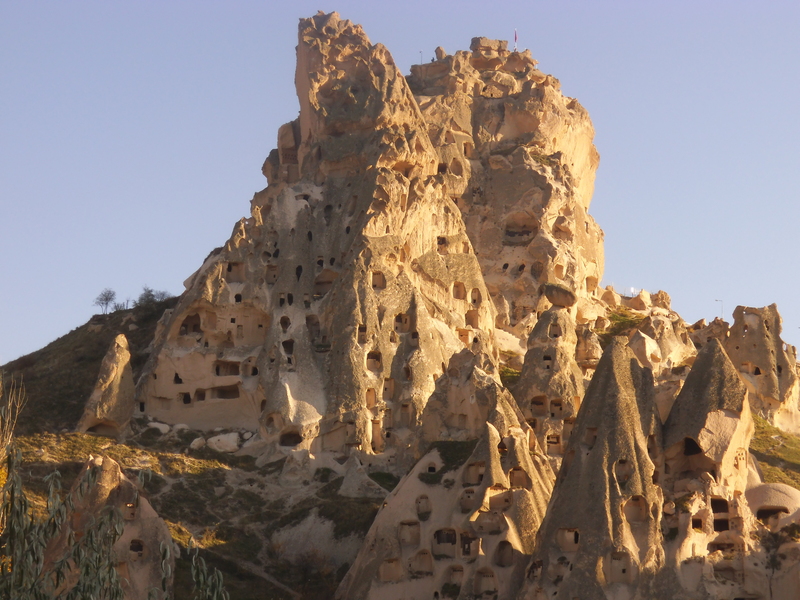 Göreme is situated among a host of fairy chimneys and pockmarked hillsides and leads to Pigeon Valley in one direction and Zemi Valley in another. The famous Open Air Museum is on the outskirts of town and this is the place to rent your scooter or ATV for touring the area. All the shopping options available in the region are present in Göreme including carpets, ceramics, gifts, and handicrafts. Regarding restaurants we recommend the Manzara with its amazing view, Dibek with local dishes includin “Testi Kebab”, Seten Restaurant, Fat Boys (Australian Turkish mix), The Evil Eye Korean Food, and Mydonose for a cup of coffee. 9. Gulşehir – If you have transportation, taking a short trip down the river to this seldom visited but very friendly town is a good option. With St. Jean’s astounding cave church, the Mantar Kaya (mushroom shaped boulder), and the refurbished Greek church you can easily spend a couple of hours enjoying the hospitality of this town. A fun experience is getting the key to the Greek church from the neighborhood leader across the street and looking around the church on your own. 10. Guzelyurt/Ihlara Valley – Another option for a day trip if you have your own transportation is this breathtaking area located a bit over an hour from Uçhisar. With Gaziemir underground city (more like a large monastery or caravanserai), Yuksek Church, the Red Church, Monastery Valley, and the all that Ihlara Valley offers, you can easily spend a day hiking, ooohing and aaahing. And with all of these we have not mentioned Hacıbektaş, Nevşehir, Özkonak, and Kozaklı. You probably need to add a few days or start planning your second trip to Cappadocia. Once you visit be sure to return and let us know which town was your favorite.